Jiangmen hony Houseware CO., LTD which supplies stainless steel products locate in Xinhui District, Jiangmen City, Guangdong province, China. 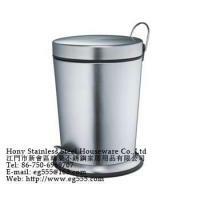 years of stainless steel products sales experience, a broad market basis, the company sells functional stainless steel products: stainless steel trash can, closestool brush, rice cooker, bread boxes; rust-proof, anti-fouling tableware, kitchen utensils, medicine box, tissue-and-towels hook, bathroom shelves, cup, gargle cup, bathroom hinge, soap dish, tissue boxes, wash basin; resistance Corrosion-stoup, mix goblet, ice bucket, small stoup; heat-resistant pot, ashtray, water pot, stainless steel kettles, and so on household items. Nice products, reliable quality and variety, full specifications, prices distinctions, since its establishment by the customers favor. Products were sold well all over the world. The company aims to technology and development to serve the order to survive, relying on advanced technology systems , powerful and perfect management system, with a solid platform for domestic and foreign markets , bigger and stronger doing fine, a similar business model and brand name, building The development of enterprises take off. Company Benefits: second-tier brands to take the front line brand. Keyword: Houseware, Home Supplies, stainless steel hook, wall hook, message board, bathroom products, Bathroom sets, bath bottle, mouth cup, toilet brush, Clean brushes, bread box, medicine chest, medicine box, mirror box, bathroom cabinet, bathroom box, trash can, cosmetics cases, seal pot, dishware, kitchenware, Electric Kettle, pump, nozzles, soap dish, tissue box, ice bucket, dustbin, dish rack, wine rack, wine stopper, seasoning cans, bathroom basket, stainless steel products, stainless steel houseware, hardware products, metal products, stainless steel wares, stainless steel prices, stainless steel website, stainless steel factory.